Home Brands AKG D5 Dynamic Microphone Review: Should You Buy? What Sets the AKG D5 Dynamic Microphone Apart? Should You Buy the AKG D5? If you stop to think about it, microphones have it tough. You yell at them, spit on them, even drop them. The AKG D5 dynamic microphone can take a lot of abuse and keep working. But you don't need to be a rock star or a battle rapper to take full advantage of the AKG D5. Whether you're organizing a conference, recording a podcast, or even starting out in stand-up comedy, you can benefit from a dependable microphone. So what makes a microphone "dynamic"? First, there are several classes of microphone. Dynamic is one of them. A dynamic microphone can pick up sound from 360 degrees. It has a thin diaphragm of mylar overtop of an extremely tiny hair of copper wire, which gets suspended in a magnetic field. When sound vibrates the diaphragm, the copper wire reverberates in the magnetic field, creating electricity. That electrical current converts into sound. While dynamic microphones come in all shapes and sizes, their underlying technology remains the same. After looking at this microphone in-depth and reading the reviews people gave it, we were able to determine what makes the AKG D5 shine, and where it comes up short. The last thing we did was compare the AKG D5 to some of the competition to see how it stacks up. For instance, is the famous Shure SM58 still the king of microphones? Or perhaps the more affordable Audio-Technica ATR2100 is just as good as the AKG D5? Before we could determine whether or not the D5 is worth buying, we wanted to see if there were better options out there. Shure is the king of microphones. They've dominated this industry since 1925. That's when Sidney Shure set up shop in Chicago. But it wasn't until the 1990s that Shure moved into the top spot with their world-famous SM57 microphone. This mic sets the standard for how professional-grade dynamic mic should sound. You can see Eddie Vedder rocking out with a Shure SM57 in many of Pearl Jam's videos. Eminem uses Shure. Comedy clubs stock Shure. Can the AKG D5 compete? Shure's next-generation of gold-standard microphones is the SM58, which looks almost identical to the SM57. However, it brings some innovations to the table, including a pneumatic shock absorber which reduces handling noise, and a spherical wind and pop filter. Also, it's designed to be rugged. At 6 inches, it's significantly shorter than the D5. The SM58 costs between $99 and $120, but only comes with a one-year warranty. 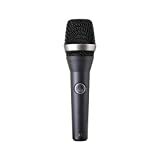 Customers on Amazon gave the king of microphones 4.7 out of 5 stars. This is one of the highest ratings for a microphone that we've seen. Everyone seemed to love the durability of this mic, citing that it can take a beating and still lasts forever. When it comes to sound quality, people had nothing but praise. One guy wrote that he's in a metal band, and it's the only mic that doesn't "feedback like a banshee while I'm screaming into it." On the other hand, many people reported issues with the sound the SM58 puts out. It's not as loud as some other mics, and without good audio equipment, it can make your voice sound muffled. Next up in our comparison is the Audio-Technica ATR2100. This dynamic USB microphone is signifcantly more affordable than both the Shure SM58 and the AKG D5. Audio-Technica is a Japanese audio company. They make headphones and other audio equipment in addition to microphones, but their microphones are their bread and butter. Audio-Technica started in 1962, right in the heart of Tokyo. They're ATR2100 dynamic microphone has both a USB output so that you can connect to your computer, and an XLR output for live and studio performances. Even more interesting, it has a 3.5-millimeter headphone jack, so you can plug in and monitor your own sound quality as you use the mic. The mic's cardioid polarized build eliminates background noise, so you only hear your voice. It's eight inches long, the same size as the AKG D5. The ATR2100 costs between $60 and $80, but best of all it comes with a lifetime warranty. And this isn't for the life of the microphone; it's for the life of the purchaser. Customers on Amazon were happy with it, rating it 4.2 out of 5 stars. Many of them used this mic with their computer, for YouTube channels and podcasting, and said the clarity of the sound was amazing. It does a great job of eliminating background noise. Also, those who play music live praised the audio quality. One musician wrote that he used it with his acoustic guitar and the sound accuracy was the best he'd heard. On the other hand, quite a few customers reported issues with the USB and XLR connectors breaking easily. It seems a slight drop, or even just a year of use, can render these ports unusable. Finally, we looked at the Sennheiser MD431-II. This is an expensive microphone which considers itself "premium." We wanted to give you an idea of what a microphone in some higher price points looks like. Sennheiser started up in Germany two weeks after the end of World War II. Seven engineers from the University of Hannover, finding themselves with nothing to do now that the war was over, set up shop building audio equipment. They have the honor of creating the earbud headphones back in 1962. The Sennheiser MD431-II is a super-cardioid dynamic microphone. A steel mesh grill houses a pop filter, while the entire top is protected by a shock-suspended capsule. Finally, there's a locking on/off switch, so you don't have to worry about accidently turning off your mic in mid-concert. Make no mistakes; this is an expensive microphone. You can buy a Sennheiser MD431-II for between $450 and $500. Also, it comes with a two-year warranty. Despite its high price, customers on Amazon only rated it 3.2 out of 5 stars. Most people said the mic sounds nice, but there wasn't too much praise available. On the other hand, quite a few people complained that the output from this gear is muffled, and very quiet. A singer-songwriter who plays acoustic guitar said that her audience could barely hear her. For such an expensive piece of hardware, we would have liked to see better reviews. At first glance, the AKG D5 looks like any average microphone. It's a mesh ball sitting on top of a handle. Also, it's a wired microphone so there's an XLR microphone cable coming out of the bottom. But inside the microphone is where the AKG D5 starts to shine. Unlike other dynamic microphones, the AKG D5 has a variable-thickness diaphragm. It has different thicknesses intended to draw sound in and focus it into the center. Also, the diaphragm is laminated, creating extra smoothness. The end result is a crisp sound with no mechanical feedback. This microphone is intended for live audiences, and that's where it shines. Because we wanted to create as fair a review as possible, we went to several different sources to dig up as much information as we could. First, we visited the AKG website to see what they said about their own product. After that, we checked out what the expert reviewers at Music Radar had to say about the AKG D5 dynamic microphone. They are dedicated to musicians, so we decided that if a microphone is good enough for them, it will be great for anybody else. Then, we checked out what customers on Amazon had to say about it. Reading customer reviews is a great way to learn how a product performs in real life. Finally, we compared the AKG D5 to three of its competitors. This way, we were able to see how well it stacks up to the competition. After all that, we were able to determine if you should buy this microphone or not. The AKG D5 dynamic microphone is a rugged piece of hardware. It looks and feels solid. Because it weighs just under two pounds, it has a premium feel to it. Also, it's nearly eight inches long, which makes it difficult to drop. At three inches thick, men and women can both hold this microphone comfortably. The grill is built with springy steel-wire mesh. But it's inside where the magic happens. As we mentioned, AKG has included a variable-thickness diaphragm to draw sound in. This creates a more precise sound than some other microphones. You can buy the AKG D5 microphone for between $95 and $115. This price range is consistent with other microphones of this class, although with the added innovation inside the AKG D5, we find this to be a great price. Also, it comes with a limited two-year warranty. We love good warranties because it means the manufacturer is confident in their product. And while most microphone manufacturers only include a one-year warranty, AKG shows they are supremely confident in this microphone. It's not uncommon for a manufacturer to tout the benefits of their own products. AKG didn't give us too much information about the D5, but what they did say made it seem like the greatest microphone since the Shure SM​​57. Because we want an unbiased review, we turned to the professionals over at Music Radar to see what they had to say, and then we looked at Amazon customer reviews. This way, we were able to push all the hype aside and find out if this is a mic you should consider. The good folks at Music Radar are focused on musicians. They write great articles, cover music industry-related news, and tear down the gear in product reviews. Their review of the AKG D5 dynamic microphone was informative and easy to read. They liked quite a bit about this mic, praising its sonic performance. It was praised as "accurate" and "well-balanced." 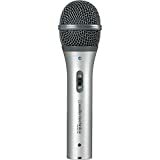 They strongly recommend this microphone for live vocalists, because it performs well at mid-frequency. However, they didn't like that it has a "propensity for feedback at a lower frequency..." They considered its handling to be a little noisy because of this. All in all, Music Radar endorsed the AKG D5 microphone. Next, we went to Amazon and checked out what customers had written after purchasing an AKG D5 mic. Customers gave it 4.3 out of 5 stars. Almost everybody loved this microphone. It was praised for its ability to handle loud noise. One reviewer said that it could handle intense vocal pressure so you can "sing real close to the mic." Another said the microphone is "crisp, clear, and loud." Many customers also loved the sturdiness of this mic. It's a solid mic with great heft. On the other hand, many Amazon customers complained about the same things that the reviewers at Music Radar didn't like. The feedback on this microphone is intense, and it will start howling at six decibels. One person mentioned that you need to set your phantom power to "high" and it should take care of many of the microphone's issues. Unfortunately, the company doesn't mention that anywhere, and it took a sound engineer on Amazon to tell us. If you were to compare the AKG D5 to the Shure SM58, you would be hard-pressed to not pick up the Shure and head to the cashier. However, we were able to look at the AKG D5 in some detail, and then see what others thought about it. Only after that did we compare it to the king of microphones. Because the AKG D5 is a great piece of gear, we can enthusiastically recommend that you buy it, especially when compared to the Audio-Technica and the Sennheiser. But, the Shure SM58 is still a better microphone. Because it has the same price, yet manages feedback so much better, we have to say that the Shure is the mic to buy. However, if there are none around, then grab yourself an AKG D5. It's the second best dynamic microphone in this review.